When it comes to design and making over a room in your home, the first things that come to mind are new colors on the walls, updating your throw pillows and blankets, or even bringing new artwork to your walls. An often under-looked method to bring a fresh look to your space is through the use of pendant lighting. Since pendant lights are available in a variety of colors, styles, and sizes, they have the ability to make a simple yet strong impact in your home design. The great thing about pendant lighting is that you can pack a one-two punch by providing your room with necessary lighting, along with stylish design. You can scatter pendants throughout your room, or choose multiple, smaller pendants to hang in groups for a fun, uplifting look. Pendant lighting is not just for your kitchen, and can often be incorporated in hallways, living rooms, and dining rooms.There is no right or wrong look when it comes to choosing pendant lights, so whether you prefer an industrial vibe, or more of a modern look, there is a style fit for your design. 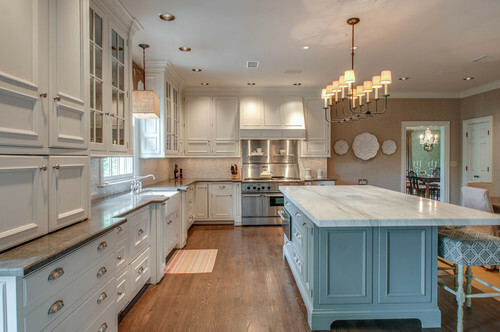 Which room would you incorporate pendant lighting in? With a mission to “deliver happy, well designed spaces that are both functional and beautiful as well as a reflection of the client’s personality,” it’s no wonder that designer Stephanie Stroud of Zollars Stroud Interiors provides her clients with a glowing experience and a gorgeous home. Based out of Overland Park, KS, and coming to us from IDG showroom Madden-McFarland Interiors. Stephanie, who heads up Zollars Stroud Interiors alongside her husband, offers her clients new build selections and project management, furniture purchasing and plans, color schemes, accessories and artwork, and custom window and wall coverings. 2016 is the year of both minimalism and individuality. The year to simplify your design with only the pieces of artwork and furniture that truly speak to you. It's the year to finally declutter your space and remove any decor that no longer serves a purpose in your room or that no longer fits your personality. Patterns are coming back strong and in full force, so mix and match your patterns and do it without holding back! Choose patterns that speak to your personality and reflect the story of your room. Do you want an upbeat living room? If yes, then choose funky and bright patterns. If you prefer to take a more modern approach, try patterns that are bold yet neutral. When it comes to individuality, think custom pillows, a patterned accent rug for your living room, or a limited edition lamp that won't be found in your neighbor's living room. Since individuality is more powerful than cookie-cutter designs, it's important that you allow your room's design to truly shine through with a minimialistic approach. Take out pieces that no longer fit your design or life, and give your one-of-a-kind art or patterned pillows the room to do all of the talking. How would you design your home with individualism and minimalism?